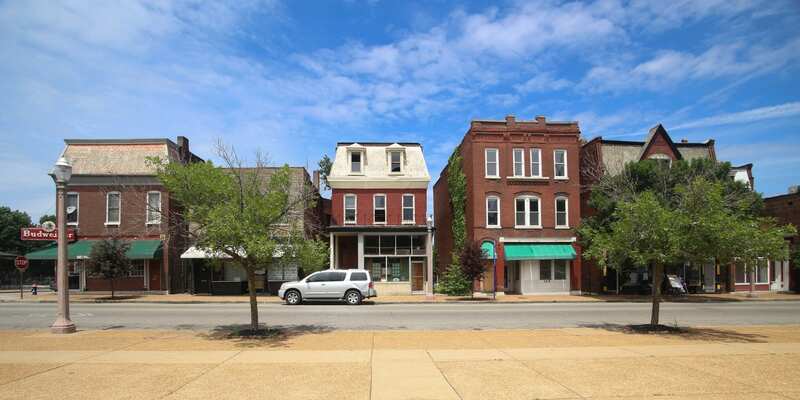 The Gravois Park Neighborhood Association holds their regular meeting on Tuesday, July 10th at 6pm at in the old Jefferson Bank building at 3353 California, just north of Cherokee). Dutchtown West also meets on Tuesday, July 10th. Their meeting is at 7pm in the banquet hall at Grbic Restaurant, 4071 Keokuk at Meramec. The Cherokee Street Business Association has their monthly meeting at Nebula at 5:30pm on Thursday, July 19th. The meeting is open to business owners, residents, property owners, and anyone else with an interest in the Cherokee Street community. All are encouraged to attend. Marine Villa holds their monthly meeting at Sister Cities Cajun. The meeting is at 7pm on Monday, July 23rd. DSCC and Thomas Dunn Learning Center host their Green Festival on Saturday, July 7th. Vendors, service providers, and other environmental groups will be on hand with information and activities to show you how to reduce your environmental impact. The festival runs from 10am to 2pm. The final installment in DSCC‘s Landlord Series is Wednesday, July 11th, 6pm at Thomas Dunn Learning Center. This session will focus on energy-efficient and green rehab projects as well as environmental issues such as proper waste disposal. The Community Empowerment Committee holds their monthly meeting on Wednesday, July 25th, 6pm at Thomas Dunn Learning Center. Dinner and child care are provided. Dutchtown South and Erase the Trace are co-hosting another So Fresh So Cleanup. In July they’ll be working in Dutchtown proper, starting from Thomas Dunn Learning Center. The cleanup is on Sunday, July 29th from 11am to 3pm. Thomas Dunn hosts multiple free summer camps for kids. In July choose from study areas such as poetry, cooking, coding, or karate. Find and register for free summer camps at Thomas Dunn and throughout St. Louis at the City’s summer camp website. 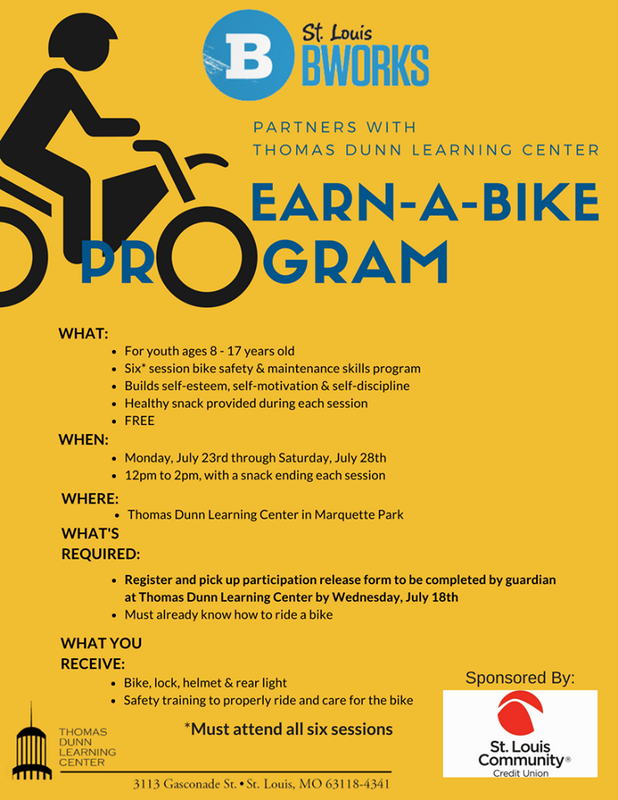 St. Louis Bicycle Works‘ Earn-a-Bike Program returns to Thomas Dunn this summer. 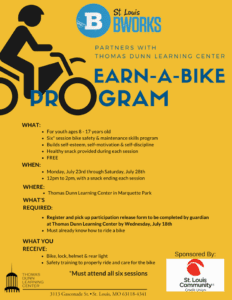 Kids ages 8 to 17 can participate in a week of bicycle safety and maintenance classes from July 23rd to July 28th. Upon completion participants receive a bike, helmet, lock, and safety light. The Dutchtown Community Improvement District has committee and board meetings throughout the month. Learn more about what the committees and board do, then find a meeting that works best for you. Tenth Life Cat Rescue hosts a Cats ‘n Mats Yoga fundraiser on Thursday, July 5th. They’ll also have story times and reading groups for kids every Saturday in July. Kairos Academies is hosting a community forum on Wednesday, July 11th to discuss their plans to bring a public charter school to Dutchtown. Attend the forum to learn more about the proposed school and provide your feedback. The Cherokee Street Community Market is back at Love Bank Park on Wednesday, July 11th. Enjoy hot food, fresh produce, art, live music, and the company of your neighbors. Flow Yoga on Meramec is offering open-level classes on Wednesday evenings. Check the calendar to find out more. Urban Eats hosts the South City Board Game Meetup every other Friday (July 13th and 27th) from 6pm to 11pm. The Feasting Fox hosts a Prohibition-themed trivia night on Friday, July 13th. $10 gets you appetizers, tastings of George Remus bourbon and other spirits, and the chance to win prizes at the end of the game. DT2 is throwing a pool party for their monthly After Hours in July. Join them at Marquette Park on Wednesday, July 18th for swimming and hotdogs. The South City Sipsters meet at the Feasting Fox on Thursday, July 26th to sample German beers and wines from Germany and Alsace. The Gravois-Jefferson Historic Neighborhood Plan has been officially adopted, and now it’s time to celebrate! Join your neighbors on Monday, July 30th at Artist Art on Cherokee to learn more about the plan and how to get involved with the implementation. Be sure to check our calendar regularly, sign up for our mailing list, and follow us on Facebook, Twitter, and Instagram. If you have an event in Dutchtown, Gravois Park, Mount Pleasant, Marine Villa, or Cherokee Street that you’d like us to share, please contact us or email info@dutchtownstl.org. This post was updated on July 2, 2018 . Read more news about Camps, Cherokee Street, Cleanups, DT2, Dutchtown, Dutchtown CID, Dutchtown Events, Dutchtown South Community Corporation, Dutchtown West, Festivals, Gravois Park, Gravois-Jefferson Historic Neighborhoods Plan, Marine Villa, Marquette Park, Meetings, So Fresh So Clean So Creative, and Thomas Dunn Learning Center.